Small Town, Big Fields, Great People! Located seven miles south of the Minnesota border and called Buffalo Center because it was midway between the north and south forks of Buffalo Creek, the town was originally built south of the present site and moved north when the Chicago and Iowa Western Railroad set up lines in northern Iowa. It was settled in 1892 on mostly swampy ground, later dredged and tiled. One of the original settlers, Howard Pomeroy, took a mower and mowed through his wheat fields to show where the streets would be, and a hardware store and a blacksmith shop were the first stores in town. Buffalo Center has survived many fires which destroyed Main Street businesses over and over, a tornado or two on the edges of town, and several blizzards like the Armistice Day storm of November 11, 1940. On August 23, 1897, Buffalo Center became the first school west of the Mississippi Rover to be consolidated, and it is believed to be the second one in the nation. 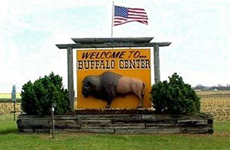 Today, Buffalo Center is a thriving town of about 1000 people. We have a large new community center, our first museum, several new businesses and a K-12 consolidated school that educates students from Buffalo Center, Rake, Lakota and Thompson. Our 4th of July celebration is a well-known all-day holiday which features a 5K, a parade, music in the park, tournaments, games and contests for the kids, and a huge fireworks display. Other annual events include the Winter Gala, the summer Meat & Music Festival, Crazy Days, the Firemen's Dance in July, and the Old-Fashioned Christmas Celebration in December.